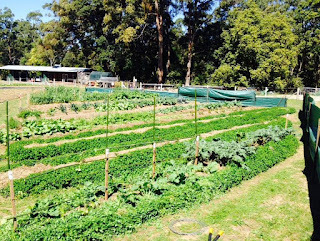 The second stop on our March outing was to a chemical and pesticide free seasonal produce and seedlings farm run by passionate farmer Darren Smith. 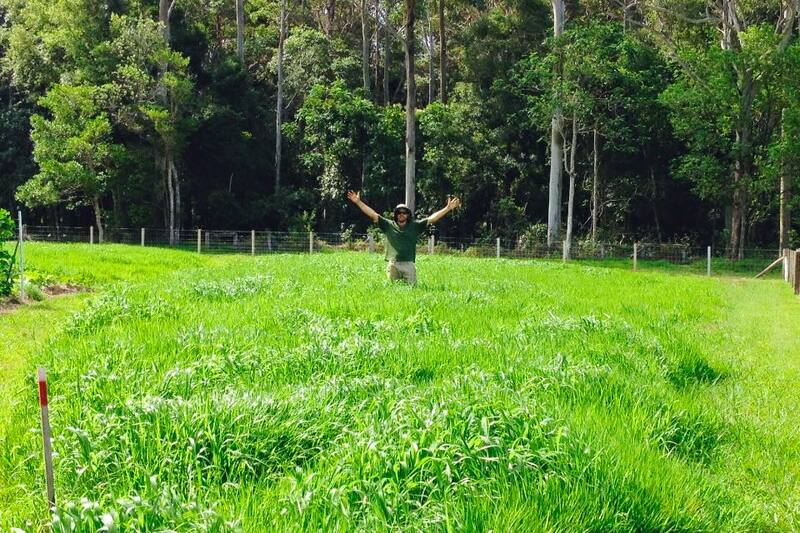 Such enthusiasm from a bloke who is 'living his dream' of providing (and hopefully) educating we locals that being sustainable and practising permaculture principles DOES make a difference. Not only to the environment, but to the overall taste of the produce. Permaculture is a lot more than just establishing an organic garden. Darren, on his farm is using Weed Gunnel - a permeable and degradable weed mat which has been specifically developed and used extensively in the organic industry. Luffa (or loofah) pictured above and to the right is a terrestrial member of the cucumber family. Eat and cook like you would a zucchini or if you're looking to scrub your back in the bath, dry over a number of weeks, then remove the skin and seeds. If you wish, they can be bleached to a more appealing colour. It is Darren's philosophy to use sustainable materials and resources in a collaborative to minimise the impact on the land and environment in growing his vegetables, fruits and herbs. Darren freely admits it has been (and still is) a learning curve for him and there have been occasions where things haven't quite worked to 'the plan'. He focuses on maintaining good, nutrient rich soil with excellent plant water take-up. This is achieved by the extensive use of mulch, both green and other eg mulched wood from on-site, trimmings etc thereby reducing depletion of water resources to the plants and on breakdown of the mulch material renewing organic stores in the soil. The use of mulch (and its breakdown process) holds to nature's continuum of boosting excellent soil health by keeping the balance in good soil - that is 24% air, 25% water, 45% minerals, 3-5% humus and up to 1% living organism. Having healthy soil will nurture the natural environment, promoting better plant health with wonderful lushness and resilience against pests and diseases. Darren pointed out that to have bare soil is not only an open invitation for pesky weedy response to a burgeoning nutrient-rich soil environment, it also encourages evapotranspiration of water resources. Even during our Coffs Coast 'wet' Darren will continue to water his plants so this vital link in the chain is not broken by loss of water to the soil. Darren makes his own soil blocks, these are small self-contained blocks of lightly compressed soil. There is a special tool that forms the blocks. As the seedlings grow, their roots reinforce the block. When it comes to planting out, it's a simple matter of popping the block into the ground holus-bolus, thereby reducing the shock of planting because there is no splitting, teasing out of roots or other damage to the plant caused by handling. The 'mix' is compost, coir-peat, sand and water. This is the combination that best suits Darren's requirements. To plant seeds in these blocks once constructed is a breeze - simply place a seed or two into each hole, topping up with compost, gently misting with water until the little holes fill with water. Keep the blocks moist and place in greenhouse (or as Darren has done right, a protected purpose-built tunnel). When roots appear on the sides of the blocks they will start to hold the soil block together and indicate that the seedlings are almost ready for transplanting, brilliant! Darren also brews up his own liquid fertilizer - he has a progressive line up of these wonderful bins (see left) using comfrey, fish emulsion and seaweed. Cassava is a shrubby plant quick to grow with thin stems and nice palm-shaped leaves. They produce tuberous roots and are the main part that is eaten. A really pretty shrub. 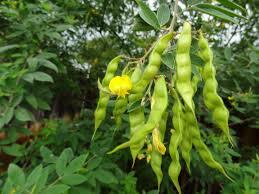 Darren has quite a number of Pigeon Pea plants from the Fabaceae family of legumes growing in his garden primarily for windbreaks and as nitrogen 'fixers'. These plants have a symbiotic relationship with the nitrogen fixing bacteria (Rhizobia). This soil bacteria that fixes nitrogen takes up residence inside root nodules of legume plants. The Rhizobia chemically converts the nitrogen from the air to make it available for the plant. In addition, every time they are pruned and also when the plant dies, the root nodules release nitrogen that can be used by other plants. So Darren is not only making a decent windbreak, he is also improving his soil for other plants. Herbs abound in this garden - they are not only used for harvest but also to attract bees, which seemed to absolutely love the Thai basil, which was in flower. This is a very serious line up with lots of lovely goodies for the garden. 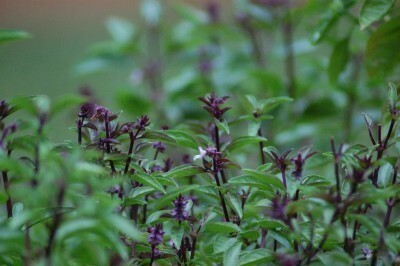 The farm has A LOT of chooks and they do their bit too in improving the health and vigor of plants. This garden is immense and it would take many hours to appreciate just how much work this most passionate ex-sparky-turned-gardener has achieved. Thank you to the Program Committee for organising such an interesting outing. The lunch at Beachstone Cafe was just lovely with lots of conversation and Darren took time out of his busy day to join us.